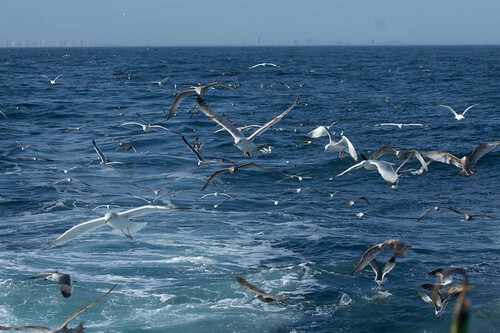 I spent 12 hours in a boat on the Atlantic Ocean, far from the Florida shore, doing what is called “pelagic birding.” (It’s just a fancy word meaning we’re out far, far from shore.) The cruise was the final field trip for the Space Coast Birding and Nature Festival, and was the perfect way for me to close my Florida adventure before starting the long drive home. It was possible I could add a bird or two to my lifelist on this trip, and I’m always excited about that possibility, but the Atlantic Ocean is vast and even with 110 pairs of eyes looking every which way, it’s easy to miss birds. So I went out open to anything, with only one actual goal—to take at least one or two good photos of the Northern Gannet, a bird I figured we couldn’t possibly miss. Gannets belong to the family Sulidae, along with boobies. Boobies nest in southern seas, but gannets breed on rocky cliffs in the North Atlantic, where they are the largest breeding seabird. Two thirds of the world’s gannets nest in the U.K., mostly in Scotland. The rest breed mostly off Canada, Ireland, the Faroe Islands, and Iceland. 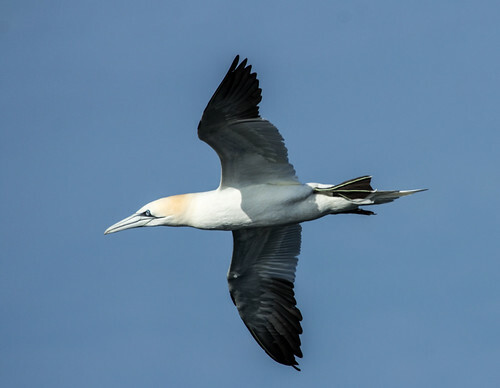 Gannets breed far from the Florida coast, but a great many migrate here in winter, and young birds remain on the Atlantic off Florida and in the Gulf of Mexico for two or more years before returning north to begin breeding. 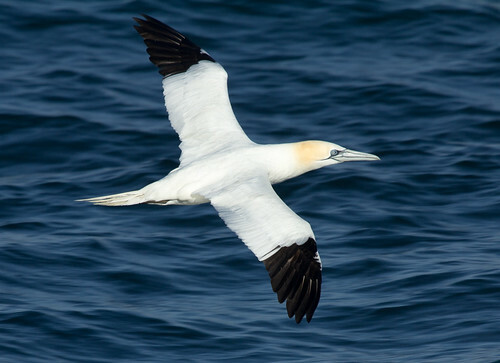 The gannet is quite abundant still, so is not listed as a bird of conservation concern, but I consider it one, because the way we’re trashing the ocean is making all ocean life so vulnerable. 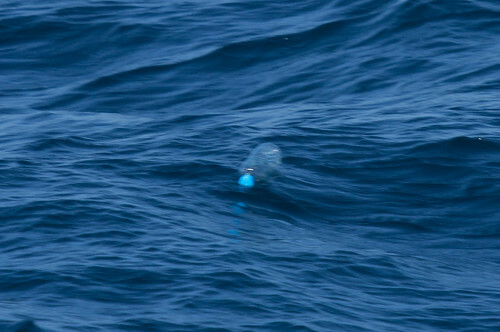 On our cruise, although my eyes were mostly focused all about searching for birds, I did spot three bits of plastic trash floating about. We also saw two container ships. Most boats are far, far more polluting than automobiles, but we don’t seem to worry about boating and ship pollution at all. We cleaned up auto emissions after it became clear that lead in the air we breathe was hurting humans, but we don’t seem to care what we put into salt water. Container ships are especially polluting because they burn bunker fuel—the filthy sludge left over from crude oil after gasoline, propane, and kerosene have been refined out. Every article we purchase from China is cheaper than what we can manufacture in America not only because labor is so cheap and there are few environmental controls to require companies to minimize pollution, but also because we can transport those items to America so cheaply via these horrifically polluting vessels. And because all countries share the ocean, there’s little any country could do to clean up the mess, even if any country wanted to, which none seem to. It’s so weird to see this bird of rocky wild islands of the North Atlantic flying so close to massive developments. But where else can they go in winter? The gannet was the bird most often collected dead or badly oiled after the BP oil spill. I was very disturbed when I attended a “media event” at one of the rehab centers following the spill to hear the spokesman from the US Fish and Wildlife Service explain that the reason every gannet thus far collected was an immature was a mystery, but that apparently the adults had figured out how to avoid oil plumes. 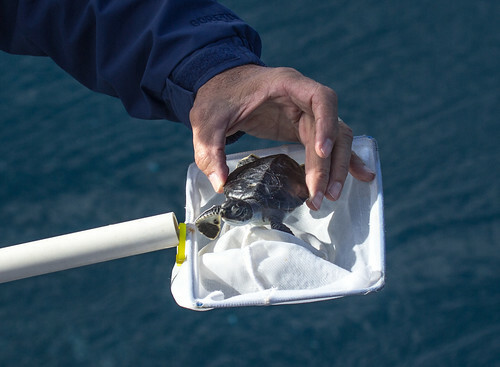 No—the reason was that all the adults were far from the Gulf when the spill occurred—already wending their way north to their breeding grounds. I couldn’t believe he didn’t at least look the bird up in a field guide to figure this out. But like everything else about the spill, the media seemed to swallow everything BP said without questioning it. 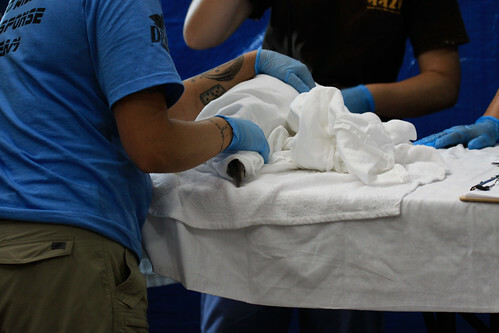 This poor first-year Northern Gannet had been oiled in the BP oil spill, and was being cared for at a rehab center in Alabama. On my pelagic trip, I tried not to think too much about trash and oil spills and bunker fuel and the many other ways we pollute the ocean while I was watching gannets. They’re gorgeous in flight or swimming, and I managed to get dozens of reasonably good photos of them. 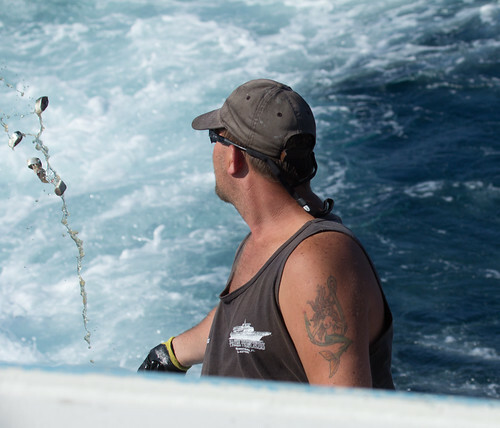 They were gathering near the boat because the crew was “chumming”—that is, tossing out fish oil and fish guts and popcorn out the back to lure in gulls, which often attract curious seabirds from a distance. The gannets watching this were diving from only ten or twenty feet above the water, though when actively fishing, may dive from as much as a hundred feet above the surface. They manage this because their nostrils are located in their mouth rather than externally, they have air sacs under the skin of their face and chest that act as bubble wrap to soften the blow when they hit water, and their eyes are located forward, providing binocular vision to accurately judge when they’ll hit. 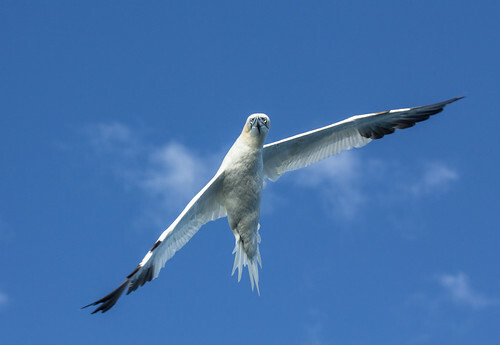 They dive so frequently that the word “gannet” has come to refer to a glutton. Next time I’ll try to take an action shot that’s in focus. We saw dozens of gannets at close range until we got out far from shore—right when we started seeing sailfish and flying fish, we stopped seeing them. 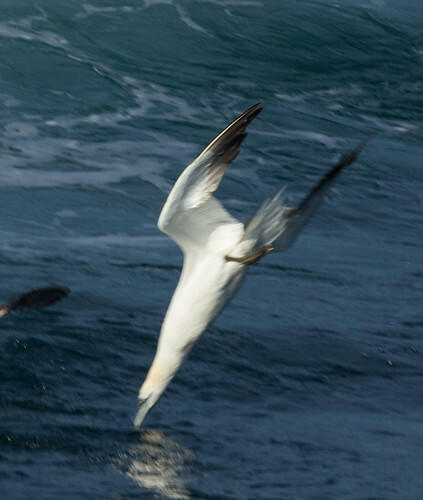 I got just a couple of slightly out-of-focus photos of gannets plunging, arrow-like, into the ocean, one of the most spectacular things they do. 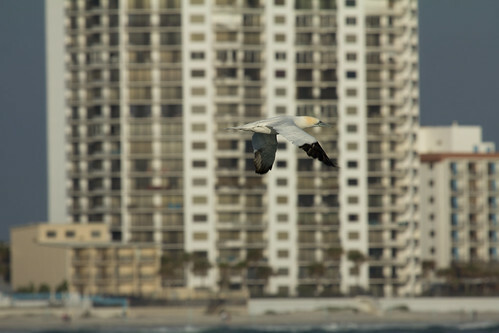 I didn’t see any of their dives from way up, though I’ve seen this at a distance from shore—next time I set out off the coast in Florida, I’ll take a fishing boat that sticks closer to where gannets are fishing so I can get better photos of their dives. That’s the coolest thing about birding: even as we try to see more birds, we enjoy seeing every little thing about the birds we’ve already seen, too. I didn’t see any lifers on this trip—the distant Brown Booby and Cory’s Shearwater and the closer Red Phalaropes, Bridled Terns, and jaegers were already on my lifelist. 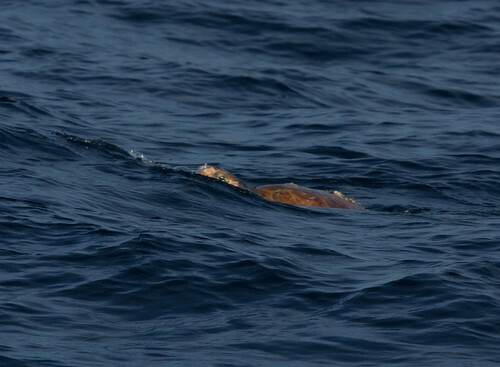 But we did see a baby Green Sea Turtle release, and got glimpses at wild adult sea turtles. 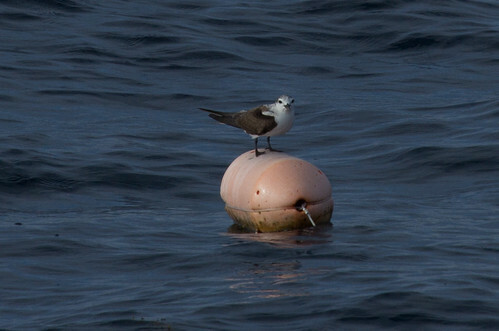 I reached my goal on this perfect day, and will head home with happy memories of my favorite seabird and a lovely voyage. This entry was posted in Uncategorized on January 30, 2013 by Laura Erickson. Then I stopped at Merritt Island’s visitor center one last time before heading on to the Brevard County Community College to give my program about the herons viewed in Cornell’s nest cam. It was the last regular program of the festival, at lunchtime when people were packing up, so I can blame that on the poor attendance–about a dozen people showed up in the rather large auditorium. Oh, well–I prefer intimate little gatherings anyway. Then it was time to wend my way up toward Daytona so I wouldn’t waste too many extra miles driving back and forth to New Smyrna Beach, where the pelagic trip would be leaving from. En route I FINALLY saw one Black Skimmer, and when I reached my hotel room, got my first gannet! My year’s total is now 173.